Wednesday, September 21, 2011 at the VFW, 20 Cedar Street in Dexter, Maine at 7:00 p.m. This workshop will cover topics and practices not ordinarily covered in lectures and articles, including: non-toxic mite and disease control; working with swarms and making nucleus colonies; swarming as an expression of the bees vitality; feeding and overwintering. Ross Conrad has learned his craft from world-renowned beekeeper and apitherapist, Charles Mraz, and Charlie’s son Bill. Conrad is a former president of the Vermont Beekeepers Association, a regular contributor to Bee Culture – The Magazine of American Beekeeping, and author of Natural Beekeeping: Organic Approaches to Modern Apiculture . Ross has given bee related presentations and led organic beekeeping workshops and classes throughout North America for many years. His small, human-scale beekeeping business Dancing Bee Gardens, sells honey and candles among other bee related products directly to friends, neighbors, and the local community. His book and some of his products will be available for sale at the workshop. The cost is $5.00 per person and pre-registration is recommended as seating is limited. 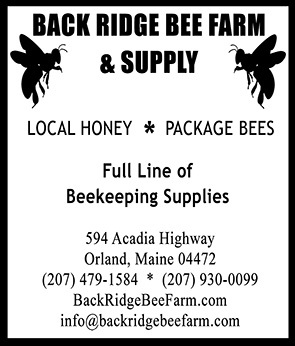 To pre-register send your name, address and telephone number along with a check or money order made out to “Penquis Beekeepers” to: Annette Geydoshek, 19 Halfway Point Lane, Hartland, ME 04943. Doors will open at 6:30 p.m. on the 21st. Walk-ins may or may not be accepted, depending on seating availability. Anyone interested in beekeeping is welcome to attend. For more information call Tish Dutson at 207-997-3546.